They're spicy, they're sweet, and now, they're moving West. Traditionally, the donair wrap — a beloved Nova Scotia delicacy consisting of a warm pita piled high with spiced meat, sticky-sweet donair sauce and other toppings — has been available almost exclusively on the East Coast. But Nicholas Nahas, owner of King of Donair, says the franchise has already opened a store in Edmonton, with more to follow elsewhere in Alberta, as well as in B.C. and the other Prairie provinces. "I've never heard of anyone who's tried a donair for the first time, who enjoys meat, who's not liked it," Nahas said in an interview Sunday. "The combination of the spiced meat and the sweet sauce really is a contrasting and complementing taste." The wrap, similar to a Greek gyro, was reputedly invented by King of Donair over 40 years ago. In 2015, Halifax named the donair as the city's official food. The idea to expand westward had been on Nahas' mind for years, but the catalyst was when King of Donair held successful pop-up shops in Calgary and Edmonton a few years ago. After seeing how many people were lining up for the tin-foil-wrapped fare, he decided to put his plan into action. "The demand and the turnout there was something that we couldn't ignore," he said. A few competing shops out West have already tried to replicate the wrap, but Nahas said it's not the same. Some may use a different type of meat, some may use the wrong sauce, and some may use different types of vegetables, opting for lettuce instead of the traditional toppings: onions and tomatoes. "The donair was invented here in Halifax in '73 without lettuce," said Nahas. "For some reason, I don't know why, lettuce just became part of the wrap out West." Kayla Burke, who runs the recently-opened Edmonton franchise, said you won't find any lettuce in her shop. Originally from Cape Breton, Burke said many Nova Scotians move to Western Canada for work and she's happy to offer nostalgic Maritimers a taste of home. "Since we've opened, we've had a line right out the door," she said Sunday, estimating that around 75 per cent of her customers are from Nova Scotia. "So many Maritimers are so excited about it." What sets the donair apart from other wraps is the sauce: made with condensed milk, vinegar, and garlic, the creamy white dressing adds a uniquely sweet and tangy flavour to the greasy treat. 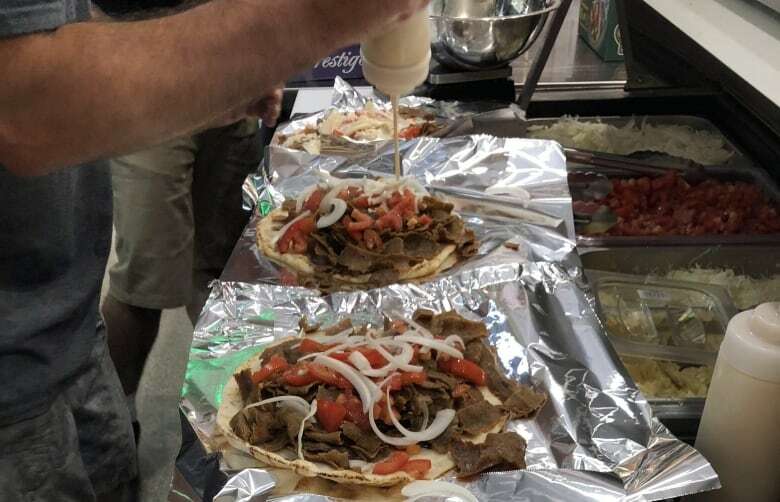 Burke said some places out West who try to replicate the donair use tzatziki, which is more savoury than sweet, adding that the shop's more traditional-tasting sauce has been a hit among customers. "Everyone's so pumped about the donair sauce," she laughed. The Edmonton shop also sells other N.S. favourites like donair pizza and garlic fingers: a cheesy, garlicky flatbread cut into narrow slices and served with either donair or marinara sauce. Another King of Donair store is set to open later this month in Grand Prairie, Alta.